This is the first bay on the left AFTER the gorge hiking track parking area. makeshift path on the left. The cliffs are actually directly below the car park. from the parking lot (perhaps while listening to the car radio even!). 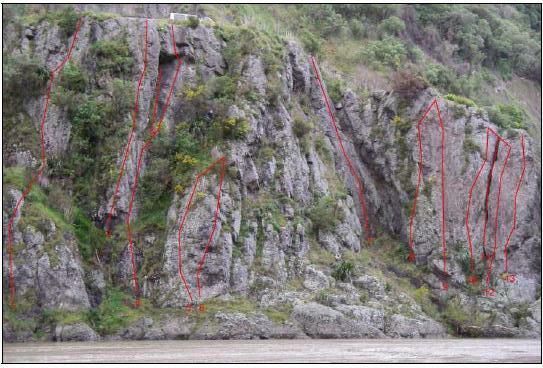 This fun, possible 2 pitch line starts at ground zero on the left end of the cliffs and heads up to a good belay ledge. It then continues up the tricky face, trending slightly right. Currently just a Top Rope from the guard rail. This seems like it would be a great line to bolt..... but the rock quality is poop. It can definitely be done as a top rope (long slings on guard rail), but it made need a bit of cleaning and a helmet should DEFINITELY be worn by the belayer! This route gets a mixed review...... the first part of the first pitch is dirty and unaesthetic but the ribbed corner (crux) on the upper portion is worth the dirt! The second pitch is a really fun slab. Start left of "Erica's Arete" on a grovely bulge, head up to a dirty ledge, head right up a nice corner and up to the 1st belay. From there, cruise up the slab to a fun roof. Either rap of rings at the top, or finish at the guard rail as a final route for the day. This line was a long time in the making as that a MASSIVE death block needed to be trundled off the top before it was deemed safe to bolt. It took 3 "after work" sessions, using pry bars and car jacks to get it off...... but DAMM what a splash!!! (variation) This is a great, easier option to run a nice, tall line. Start up "Erica's Arete," but rather than heading to the rings on the right, go left, clip the "cross over" bolt (a long sling is helpful here to reduce rope drag) and head up the second pitch of "Trundler's Delight." Although you CAN use Trundler's mid belay and do this var. as a 2 pitch, it is WAY better to do as a long, 13 bolt line!!! After many return visits, the holds that are still there seems fairly solid, the landing has been improved and COUNTLESS variations of dumb moves on bad holds have been tried! For anyone with a bit of imagination, there is potential for a bit of fun for all climbing levels. Originally cleaned and developed by Jenna Burgi, Fionn Claydon and Matt Natti (after being rained out from a trip to Balance Bridge on April 9, 2006).